The Q&A or discussion session (hereafter ‘DS’) is considered to be a quintessential feature of not only the CP itself but one of the key events of the academic conference in general. The DS is where research hypotheses are truly tested—by the judgment of one’s peers. As a result, given the combination of the open-ended, unpredictable nature of these sessions along with the heightened possibility of facing criticism, DSs can be the most stressful part of the entire conference experience, particularly for NNES and novice presenters. 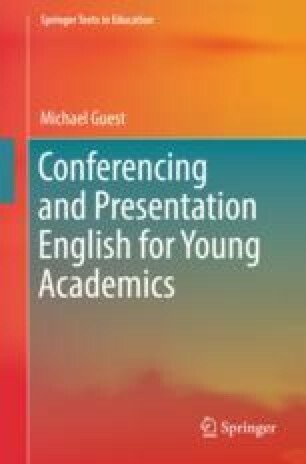 In this chapter, we will discuss the academic foundations underlying DS discourse, some of the common DS coping strategies used by effective presenters, the expected role of discussants in DSs, and some of the vagaries associated with this distinctive conference speech event.